Last year we wrote about Gordon Harrow's EP 'Indian Giver' (read on here: http://wonomagazine.blogspot.nl/2017/06/indian-giver-ep-gordon-harrow.html). A year down the road he presents new work under the name Garlands. I really liked 'Indian Giver', so I'm thrilled to learn there's new work. In a tweet I happened upon Gordon Harrow referred to a show of Canshaker Pi he supported recently and mentioning that this was no coincidence. Now Canshaker Pi is one of the most exciting young bands in The Netherlands that got treated to two rave reviews on this blog of which one very recently (read on here: http://wonomagazine.blogspot.nl/2018/05/naughty-naughty-violence-canshaker-pi.html). Some great shoes to follow. So how does Golden Sounds fare? The alternative rock jumps out of the title song. The golden sounds of San Francisco? Oh, yes, don't get me started. The U.K. has always produced my most favourite bands, but San Francisco also holds a special place, starting with Jefferson Airplane. Garlands' loud rock has not much to do with the über hippies of old though. Golden Sounds rocks out from the very first seconds. Again many influences come by in a single song. I've mentioned enough of them in the past. The Posies is the one that sticks out most again. Like that band Garlands manages to rock out with a sound pop melody always in place. In his singing Gordon Harrow produces a slight sneer, hinting perhaps that we should not take this all too seriously. Don't be fooled, this music is well worked out and tight. The little twists in 'Wake Up' show that the band wasn't satisfied with playing the song home in version one. No, experiments were put in there, reminding me, indeed, of Canshaker Pi. After a song with an upbeat and different beat, Don't Do Me Wrong', the surprise of the EP follows: the final song, 'Bingo Drag Queen'. Where the previous songs all clock in under 3 minutes, 'Bingo Drag Queen' is drawn out and totally different in atmosphere, slower also. It is easily the price song of Golden Sounds. The dynamics are great, with an alternative sounding verse and a slow rocking, full strummed chorus. "Everything will be o.k. ", Harrow sings. I believe him instantly. When songs like the four on Golden Sounds keep flowing from him, we are all bound to be. That name though, Garlands? A first search, trying to find some more info on the band, brought me to a German female duo from Hamburg, a Swedish band called The Garlands and all sorts of garlands of course. With songs like these the Scottish Garlands will undoubtedly find its place in between everything mentioned here. 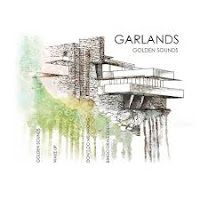 Found on Facebook at Garlands' page: "Here's a rather wonderful review of 'Golden Sounds' from my fave Dutch magazine!". That's a nice to know.